Brancepeth Castle Golf Club is located near the famous, and historic cathedral city of Durham, in the pleasant, leafy village of Brancepeth. The club was founded in 1924, and Harry Colt, one of the world’s finest architects, designed the course on the former deer park. Brancepeth Castle is a lovely parkland course, set in historic surroundings. The castle dates back to Anglo-Saxon days, and has been home to the Dobson family for the last 25 years. St Brandon’s Parish Church, dating back to Norman times, is located near the 18th green. Sadly, the church was devastated by fire in 1998, but thankfully it has since been restored. The rolling fairways of Brancepeth are immaculately maintained. The course measures 6,300 yards, so it’s not overly long by today’s standards, but the lowly par of 70, provides a stern test for many leading amateurs. 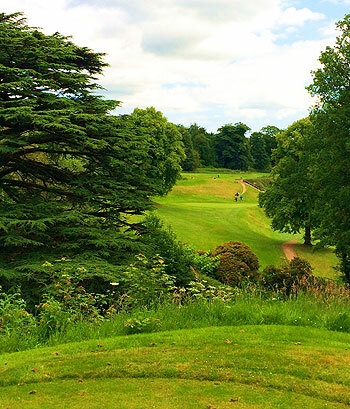 Brancepeth has played host to the final of the English County Championships, the Ladies British Open Amateur Stroke Play Championship and the English Ladies Amateur Championship. There is a great deal of variation to the holes, and the famous deep ravine, cutting through the course makes for exciting golf. The suspended walkways, crossing the ravine, are a challenge in their own right. Especially if you are nervous about heights! Brancepeth is a fascinating, and sometimes terrifying golf course. It’s full of surprises and very memorable too. Brancepeth Castle is an exhilarating parkland course played across good turf on the outskirts of Durham. The first tee is located down a lovely wooded path from the clubhouse (formerly the stables and coach house for the deer park) and this sets a lovely tone for the round where you traverse some beautiful countryside. A deep ravine cuts through the heart of the property and provides some particularly challenging shots and in essence this is what elevates Brancepeth above other golf courses of similar ilk. Indeed Colt has created a set of par-threes which are as exciting and also as dangerous as they come. Four of the five must directly cross the hazard with the 154-yard second hole an early introduction to the splendour of these daring short holes. If you can get through the back-to-back ninth and tenth holes, one-shotters topping the 200-yard mark which cross the hazard in opposite directions, in a reasonable score your job isn’t quite done but you will be well on your way to a good round because there are some birdie chances from here on in. It was also pleasing to find that the greens played nice and firm despite recent rainfall. You could hold a ball from the fairway with spin but out of the rough you really had to think carefully about where you needed to land the ball. I played a number of other top-end parkland courses around the same time as I did Brancepeth and whilst it might just be edged out by some of the more prestigious venues down in Hertfordshire and surrounding counties it stands proud as one of the best fast-running inland courses in the North of England. Great variety in lovely surroundings. No play from fairways in march, hence value rates, but didn't detract from a fun game of sporting golf. Nice turf, some challenging long irons to play, highly recommended. A decent parkland course that has some stand-out holes and is a pleasure to play and without a doubt the best course of this style in the county of Durham. The course has a strong start; a good looking short par-4 with a slight left-turn that should not give too many problems but is great fun to open with. The 2nd hole is one of the best on the course; a mid-length par-3 over the ravine that dissects the course. The early strength continues at the 3rd and the 4th – both very strong par-4’s and with stroke-indexes of 3 and 5 have to be respected. The front nine takes a little dip for me at the par-5 6th – it is long at around 550 yards but dare I say it, nothing to get excited about. The run of the holes from the 8th to the 10th is very good indeed; the 8th because it is a rare looking hole – short by modern standards at 330 yards and has the ravine to cross and then turns a little left, very nice. The 9th and 10th, both par-3’s and absolutely no give-aways – in fact, anyone with two pars on this half-way stage of the course deserves a medal; they are similar in length at around 200 yards and both require tee shots to be carried all the way to the green. Do take some time at the 9th green and look left at the majestic ‘Brancepeth Castle’ - Much of the back-nine has what I would call pretty good parkland holes without standing out, that is with the exception of another brilliant par-3 at the 15th. The final hole is going to split opinion I am afraid and I have to say, I am not a fan; the ravine needs crossing again but this time we have a par-4 around 350 yards but as this closing hole is severely uphill, it is difficult for the bulk of players to hit long enough to see anything of the green at all – I certainly do not have an answer on how to improve the hole but as it is, I think there is too much left to chance with the blind approach. I am very happy to have played and agree that this is a ‘best in county’ course – but I am not too sure if Brancepeth Castle could be considered as a English Top 100 course. The club has a strong membership and continues to do pretty well in these tough financial times and there is the familiar friendly north-east welcome to guests. Played brancepth most weeks for past 7 months. Greens haven't always been in best condition during winter, but still better than some courses I have played in the summer. The par 3's are all great and challenging, with the 2nd being my personal favourite. Can't wait to play it in summer when conditions are at their best. Ive played this course about 5 times a week for the past 9 months, and can say it is definitely one of the best courses of the north. The golf course sits beautifully in the stunning landscape, which with its steep slopes and ravines lengthens the course considerably. Accuracy on the approach shots is a must as the greens often slope front to back and have some very steep natural contours. The atmosphere in the clubhouse is excellent although if playing with the locals, be sure not to take their blunt comments to heart! I played in an Open competition, but have played there a few times. I’d agree with comments that it isn’t overly difficult by modern standards, which make it difficult to justify as a great course. It is, however, without doubt the best course in Co. Durham- the course is always in superb condition-except the bunkers-and the greens are a delight to putt on. The Par 3 9th and 10th get most publicity, but the whole course is picturesque and challenging. A genuine must play if you’re even anywhere near. Better enjoyment and value than courses like Slaley Hall. Not a course which gets a lot of publicity but it should! Some of the holes are reminiscent of Gleneagles. You need to bring your A game with you, particularly on the back to back par 3s at 9th and 10th. An underrated course.